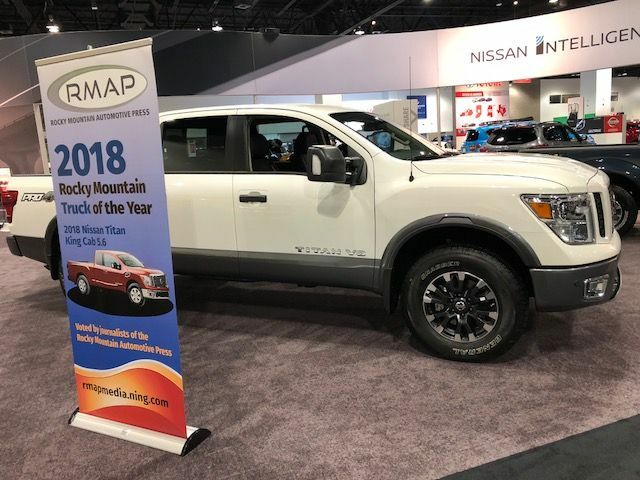 The 2018 Nissan Titan King Cab 5.6 takes home the honors as the Rocky Mountain Truck of the Year at the 2018 Denver Auto Show. The Rocky Mountain Automotive Press, also known as RMAP, review vehicles every year for how well they handle in the Rocky Mountain region. The automotive journalists rate different cars and trucks, continually keeping in mind their usefulness and handling on the mountain roads and variable terrain. This year’s winners were announced at the start of the Denver Auto Show. The impressive 2018 Nissan Titan King Cab 5.6 takes home top honors as the 2018 Rocky Mountain Truck of the Year. "The Rocky Mountains feature some of the best off-road terrain America has to offer, and the area is also home to some of the top truck enthusiasts in the country," said Tiago Castro, director, Light Commercial Vehicles Sales & Marketing, Nissan North America, Inc. "Because of that, this award holds a great amount of significance, and we are thrilled for the TITAN lineup to take home top honors." The 2018 TITAN King Cab topped the RAM 2500 and Ford F-250 in final voting. In the crossover category, the 2018 Dodge Durango SRT was selected as the 2018 Rocky Mountain SUV of the year. Back during test drives in August, FCA engineer Pete Jacobsen described the new Durango SRT as “The SUV that is perfect for anything you need to do.” The Durango SRT allows the driver to instantly switch between seven driving modes like auto, sport, track, towing, even snow mode. The Dodge Durango SRT has a 392-cubic-inch Hemi V-8 that kicks out 475 horsepower. SRT is FCA’s Street and Racing Technology designation that guarantees the vehicle is ready to run with the best of them. The automotive journalists were particularly impressed with the Durango SRT’s pick up and ability to handle the mountain elevations. In the car division, the 2018 Toyota Camry XSE was selected as the 2018 Rocky Mountain Car of the Year. The XSE is the Camry’s high level trim that combines great performance with the sportiest styling. The journalists were pleased with the Camry’s sporty handling on often rugged terrain. According to the Colorado Auto Dealers Association, the Denver Auto Show is the third oldest in the nation. The show at the Colorado Convention Center pumps an estimated $60 million into the local economy. More than 10,000 people typically attend the show which features the newest and most popular vehicles like the 2019 Ford Mustang Bullitt, 2019 Ram 1500, 2019 Chevrolet ZR2, 2019 Chevrolet Z06 Corvette, 2018 Ford Expedition and 2018 Lincoln Navigator.